Due to a scheduling conflict this workshop has been canceled. Delve into deep understanding of our Chakra System via personalized HANDS ON experience through meditation and observation! Learn what Chakras ARE and which chakras need additional support! MOVE your OWN STUCK energy for a sense of renewal and rejuvenation. Clear old patterns via personal awareness, intention and attention! 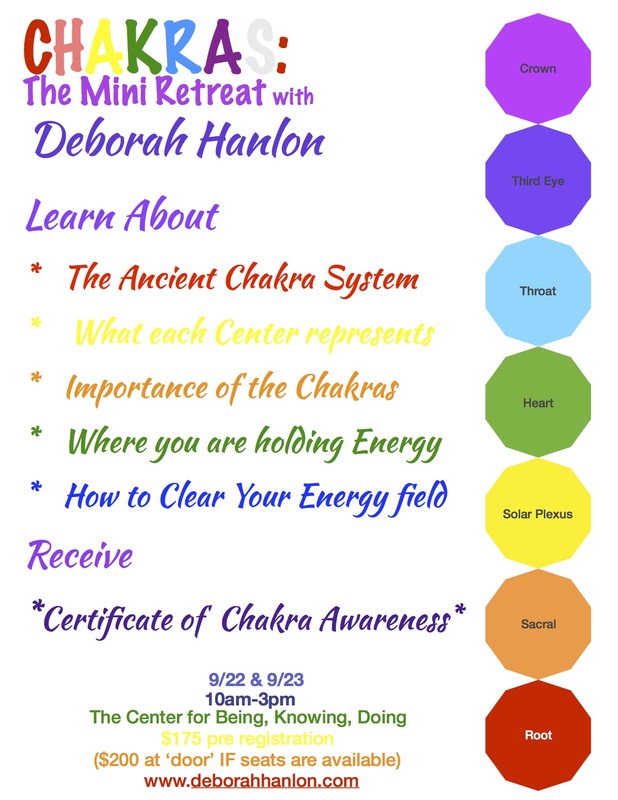 Allow Deborah Hanlon to guide you on your own comprehension of your Chakra system and how to check in on your self daily! Retreat includes Introduction to the Chakra system, tips on how to check in with your own Chakra Energy system, techniques to identify old ‘Chakra patterns’ and a certificate of Intro to Chakra Awareness! $200 and class size is extremely limited, don’t let registration close without YOU on the list!